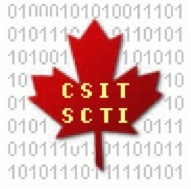 The Canadian Society of Information Theory, established in 1986, promotes research in telecommunications, information theory, and related fields. (June 6, 2018) The 16th Canadian Workshop on Information Theory (CWIT) will be held in Hamilton, Ontario, June 2-5, 2019. (March 8, 2017) We are pleased to announce that the 2017 Canadian Award for Telecommunications Research is awarded to Professor Victor C. M. Leung of the University of British Columbia. Copyright © 2019 Canadian Society of Information Theory.